Christmas is fast approaching (there's just 53 days left!) and for Jesse and I that means it's time to start thinking about presents. Actually, we've been thinking about presents for the last month as we've been doing our research to bring you the best collection of gift ideas for 2016. If you're new to Southern In Law, you probably don't know about this annual series. Each year we put together a series of gift guides to help you tick off your Christmas shopping list. We're starting today with our Kids gift guide and soon you'll be seeing our gift guides for men, women, babies and foodies. The best bits: To celebrate Twister's 50th Anniversary they've added two new moves to the classic game - Spinners Choice and Air. Spinners choice lets players choose a move for their opponent whilst Air sees the player balancing precariously as they lift a hand or foot off the mat. The best bits: Googly Eyes will have the whole family giggling as players take their turns putting on the crazy vision-altering glasses and try to draw a picture for their team mates to guess. Available at: Target, Big W, Amazon and other retailers. The best bits: Perfect for kids who like all things gross and gooey, Gooey Louie is a game where players take turns picking Louie's boogers as they try not to pull the booger that makes Gooey Louie's brain explode! The best bits: The ToDo Game is perfect for families looking to spend more quality time together but who are stuck for ideas on what to do. From putting together a family tree to having a family debate or talent show, this game has plenty of options to get kids away from screens and making memories. Available at: Online or at selected stockists. The best bits: Skylander's Imaginators sees players unleashing their imaginations as they bring their own character creations to life as they work together to stop the evil Kaos. Winning the Best Family Game of the year, Skylanders lets two players play together at one time. Available at: All major retailers and specialty game stores. Best for: Any little learner who either loves making up their own stories - or who needs some encouragement with literacy. The best bits: I have used these stones with the little boy I volunteer with to improve his literacy skills as we work together to create stories and make-up games. Not only are they fun to play with, they help to develop vocabulary and improve language, thinking and listening skills. Available at: Online and selected stockists. 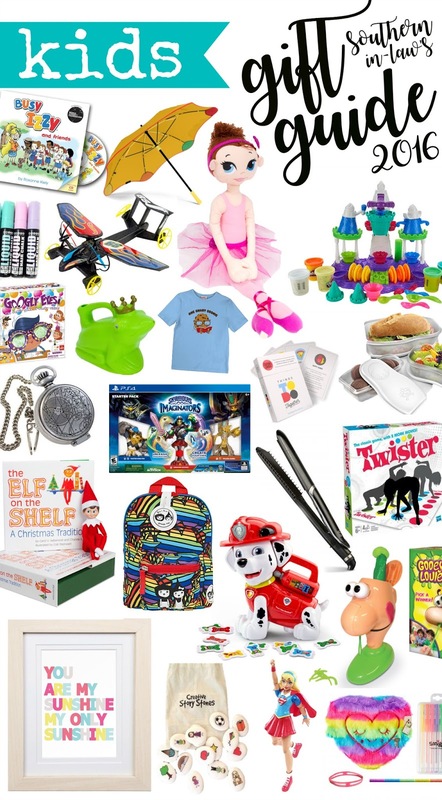 The best bits: Smiggle is one of our go-to shops when looking for stocking stuffers and gifts for our little friends. Their gift packs are a great gift option when you're not sure what to buy - especially as kids prepare for the new school year! Smiggle have everything from stationery and games to backpacks and lunch boxes so there's something for everyone! Best for: Any Paw Patrol fan aged 3-6. The best bits: Perfect for little learners, Marshall introduces kids to letters, numbers, phonics and more as he recognises the treat given to him. Marshall can also be programmed to recognise the first letter of your child's name each time he's given that specific treat to help them recognise specific letters. Available at: All major department stores and toy retailers. The best bits: Kids love splashing in puddles enough anyway but this umbrella makes it even more fun as the colour changing ink "magically" reveals a fun print as soon as it gets wet. The best bits: Izzy is a great role model for kids and the stories encourage a love of learning with their fun rhythm and rhyme. Busy Izzy and her Friends also comes with a CD with fun songs and delicious recipes to really engage little learners and encourage them to read along. Best for: All ages - a perfect stocking stuffer! How much: Currently on sale for $14.95 for 3. The best bits: Super cute and super practical, these containers make the perfect stocking stuffer! The best bits: Perfect for any little dancer, the ballerina and me doll is a lifesize doll with foot straps that allow you to spin and dance around all day. The dolls are available in a variety of looks with hair clips available so your little ballerina can match their doll! Available at: Online or selected stockists. Best for: Any little superhero! The best bits: Girl power! These dolls are ready to fight crime and save the cities. Unleash your power and explore your inner super hero with Batgirl, Supergirl, Wonder Woman, Harley Quinn, Bumble Bee and Poisin Ivy. The best bits: Barbie makes our list every year as she's always a childhood favourite. This year Barbie has a new Rainbow Cove Princess Castle Playset, Ultimate Puppy Mobile, Dancing Fun Horse and Spin Art Designer Playset that will inspire hours of imaginative play. Available at: All major retailers. Who for: Any teen girl interested in hair/makeup etc. The best bits: The VS Diamond Shine Straightener is super easy to use and straightens hair in one pass. The straightener features a unique comb guide on one side to smooth, detangle and straighten all in one, making it perfect for anyone new to straightening as well as straightener pro's. Available at: Target, Myer, David Jones, Harvey Norman and Bing Lee. Who for: Any Doctor Who fan! The best bits: Perfect for any Doctor Who fan, this fob watch is fully functional and features both light and sound effects as The Doctor speaks through the watch. The best bits: Transforming from car to plane, the Sky Shock is perfect for kids big and small (and really big kids pretending to be "adults") and will provide hours of fun. Available at: Kmart, Target, Big W, Toys R Us and independant retailers. The best bits: Forget coloured hair spray, liquid hair chalk is the new obsession and kids and teens alike will LOVE transforming their hair with Organix's fun pastel and bright hair chalks. Don't worry, Mum! One quick shampoo is all it takes to wash them out. Available at: Online or at Woolworths or Priceline. The best bits: A fun family tradition, the Elf on the Shelf comes with a story book to introduce kids to their new pal before Mum and Dad have some fun hiding the Elf in new places each night, seeing him get up to all sorts of mischief as he travels back and forth to the North Pole to report back to Santa on the childrens' behaviour. Available at: Now available at Myer, Dymocks and Specialty Retailers. Who for: Avid gardeners or any little one you want to encourage to spend more time outside. The best bits: The perfect stocking stuffer, this cute watering can allows little ones to help Mum or Dad out whilst also encouraging them to spend more time outside learning. Available at: Online at Annabel Trends. Who for: Kids and teens of all ages and sizes. The best bits: SnorgTees have an incredible range of shirts and accessories for kids and adults of all ages and are one of our go-to stocking stuffers. The best bits: PlayDoh is a tried and true favourite of kids around the globe and this year they have so many fun playsets. They're a great stocking stuffer and encourage creative play whilst improving fine motor skills. The best bits: Fizzy Pop Designs have an incredible range of art work and wall decor to suit every type of personality and every style of room. But tell me, what's the best gift you received as a kid? And when do you start your Christmas shopping? What's on your list for the kids in your life?